Something that was clear from my reader survey a few months ago is that while I show a lot of styled areas, I don’t necessarily explain as to how I “arrived” at the finished “moments”. 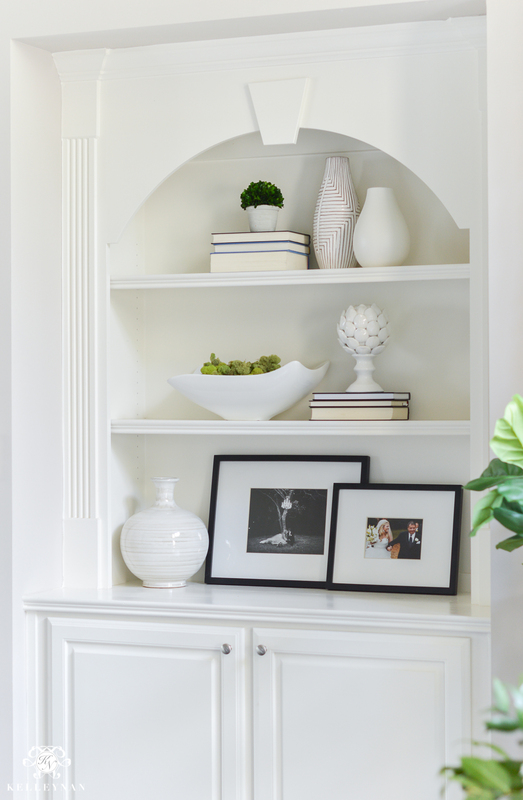 I had requests for a lot of how-to’s and my method for styling areas like console tables and coffee tables but one space that showed up repeatedly was how I style my built-ins. So today, we’re gonna do just that. I’ve rounded up areas around my house over the last year and I’m gonna give some tips and ideas for styling bookshelves. Before you even look at your bookshelf, you’re gonna need to determine what you consider as the “purpose” of shelving in general. I say this because there are some people (you may be one) who 100% believe the only intended use of a bookshelf is to hold books. That’s it. I have seen bookshelf extremists actually become offended if they don’t see what they deem as “enough” books on a shelf (or Heaven forbid, they are turned backwards). If you are in this group of people, consider this your warning to head up to the “x” at the top of your screen and skip this post haha. Or, do you have a lot of special family moments you like to display? Special memories from travels? Do you view your bookshelves as an opportunity to create “art”? I fall in the latter category. You may too and you just don’t know it 😉 If you like the look of simplified, cohesive bookshelves but don’t think you can do it because you have too many “special things”, you totally can. You have have functional and pretty shelves. We’ll talk about how you can incorporate a lot of the sentimental items but look for other homes to display them, also. 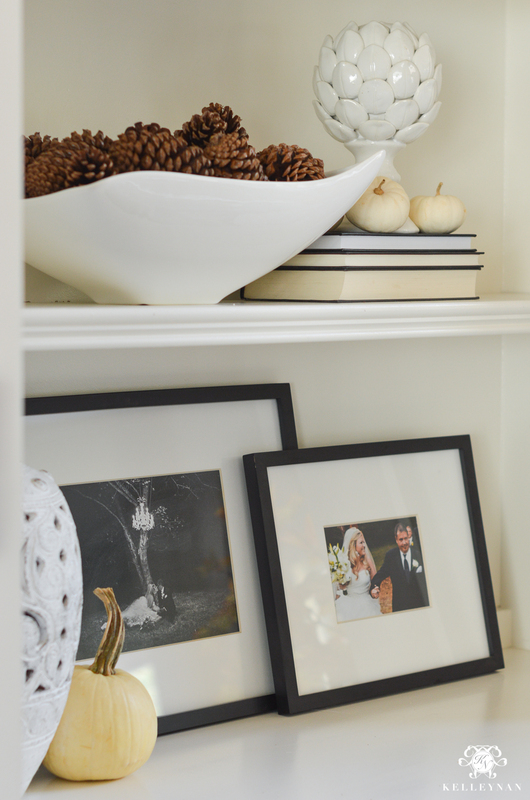 You don’t have to have every family photo piled on three shelves. Maybe think about creating a gallery wall. Or keep a select few and coordinate their frames. Ok, so now that I’ve given fair warning, let’s jump into my method of designing my bookshelves. 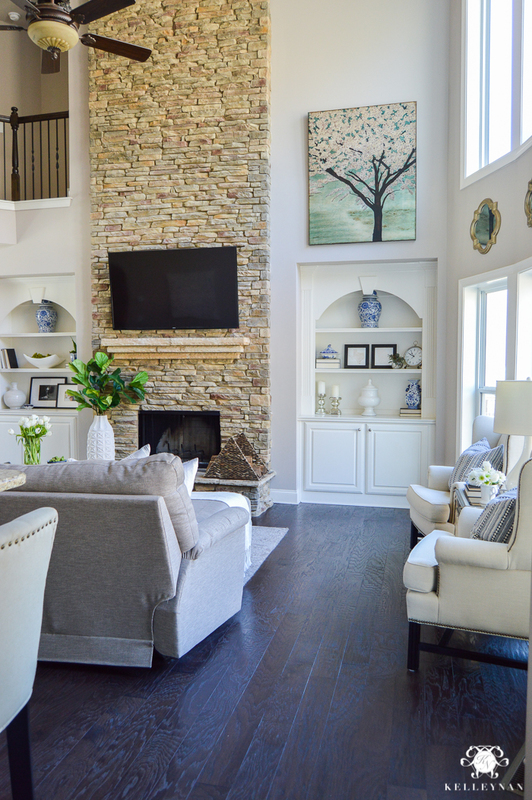 The built-ins in our great room probably see the most “action” and rotation throughout the seasons. I have had a lot of styling practice on these; when we first moved in, I filled them up, and then had to edit down. Because they frame the focal point of the room, I don’t want to make them look like a jumbled mess (or even too collected). Sometimes I carry a mirror image of items over to the opposite shelf, and other times, I just try to coordinate similar scales and styles. Here are some general tips to keep in mind. 1. First, take everything off your shelves. EVERYTHING. You want to start with a blank canvas. It’s easier to start from scratch without trying to work around what’s already in place. Plus, it will help you get a little more creative. 2. Decide on your “look”/color scheme and gather items of varying sizes. If you prefer to mix finishes/textures, that’s great! Just try to make sure each finish repeats itself somewhere else. 5. Layer up and layer the depth but go easy on styling straight across (it’s ok to leave room on your shelves 😉 ) Just because they can hold more doesn’t mean they have to. 6. 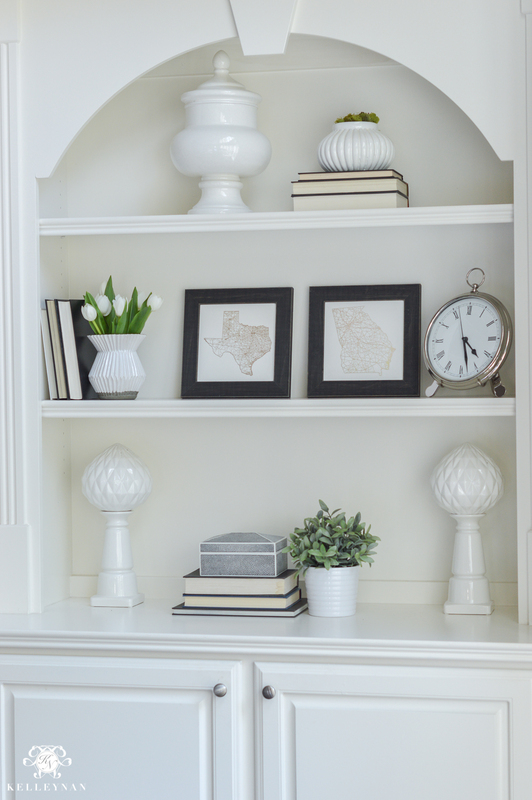 Instead of trying to style an entire shelf, try to create small vignettes within each shelf. 7. Use books horizontally and vertically. It’s ok for the vertical books to lean. 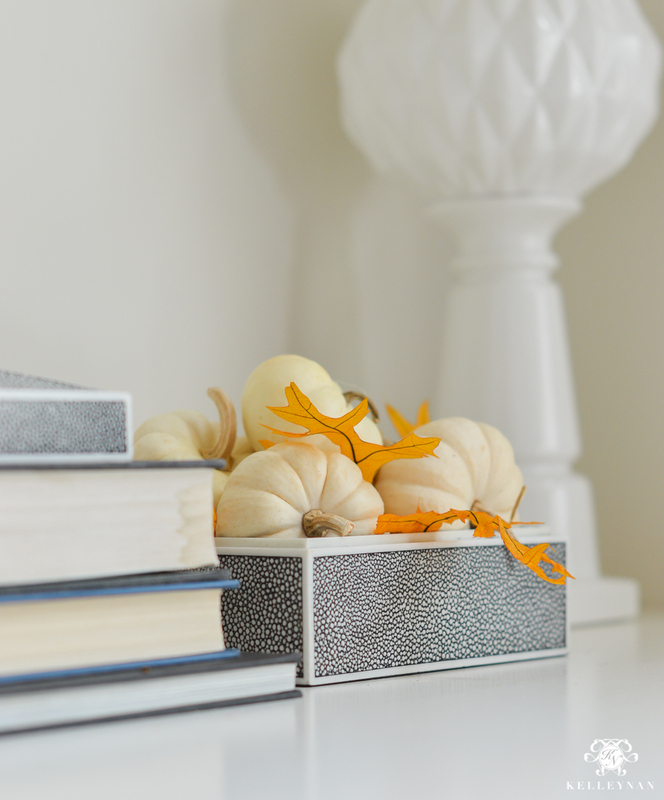 Use them to boost smaller items/vignettes and use some objects as faux bookends. 9. Work all sets of shelves simultaneously. If you have a pair of shelves, work on scaling them at the same time. If you work to get one set perfect, you may be disappointed that the second set only gets the leftovers with items that may be sized disproportionately. 12. Invest in pieces that can be used across seasons and be made to take on a new look with a slight update- boxes, lanterns, vases, etc. 13. If you are looking to create a monochromatic statement, don’t discount pieces you previously discarded. Have ceramic pieces in red? Spray paint them. The Dollar Store is a great place to hunt for inexpensive pieces too, if you plan to spray paint them. 14. 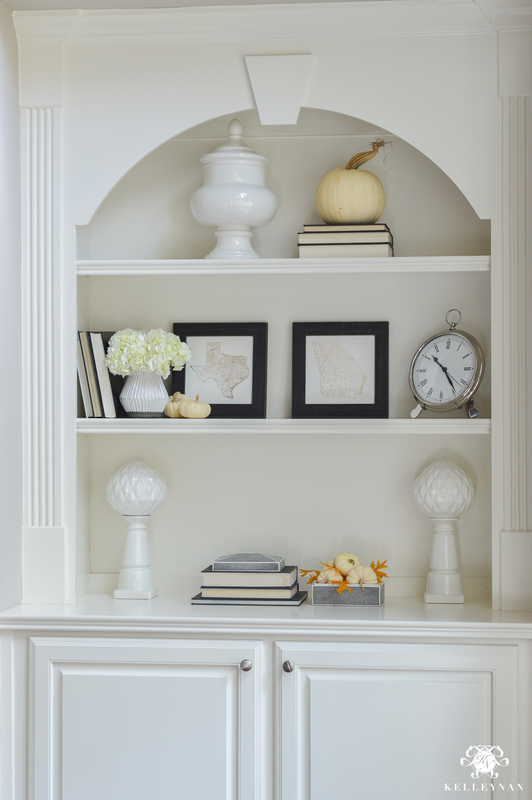 If you have a difficult time making your shelves seem balanced, start with an identical heavy piece on top of each. Once you get used to the scale, it will be easier for you to identify other appropriate pieces throughout your house or when you’re shopping. 15. Resist the urge to fill big shelves with tiny knick knacks. If you do have special littles, gather them together in a tray or use something to corral them into one focal point. This will make them appear collectively as one unit instead of a bunch of scattered collectables. 17. Treat yourself to some new supplies. You don’t have to use an ugly binder and put it on display, just because you already have it. Save that for a hidden drawer or make the decision to upgrade. 18. 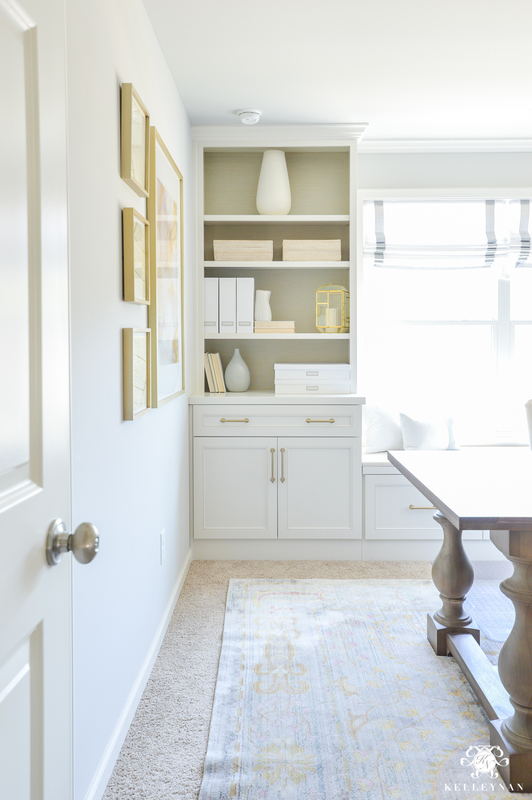 If you aren’t careful, supply shelves can quickly take a turn to looking more like an office supply closet. 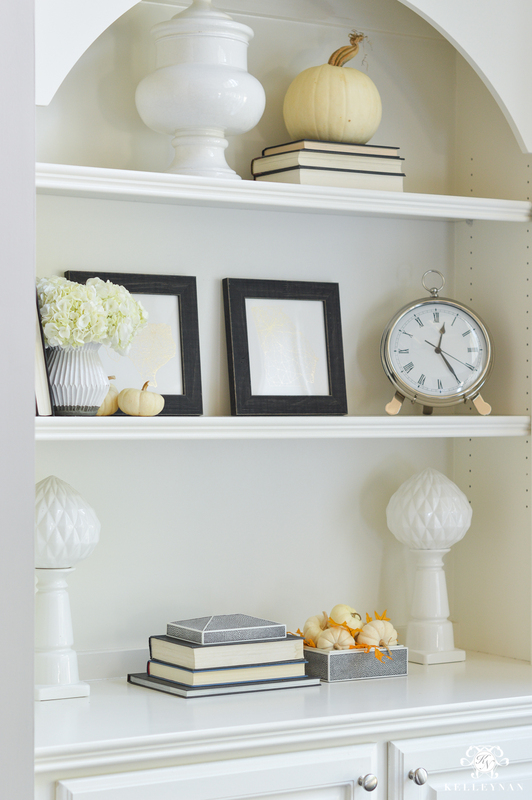 Stagger and group like items throughout to make your shelves look more intentional. Lastly, if you plan to take on a shelf styling overhaul, take a before photo so you can compare it to the after (and, I’d love to see your transformations!). My next shelving transition will be happening soon as I start to prepare for Christmas. You can subscribe to my emails at the bottom of this post to see all the festive Christmas-y things ahead! Awesome post Kelley! Great tips. I was just FaceTiming with my mom doing a bookshelf and she helped me “edit down”. As always, you’re the best at what you do! These are all such superb tips! I know I have too many things on my shelves… definitely need your help! Love this post! 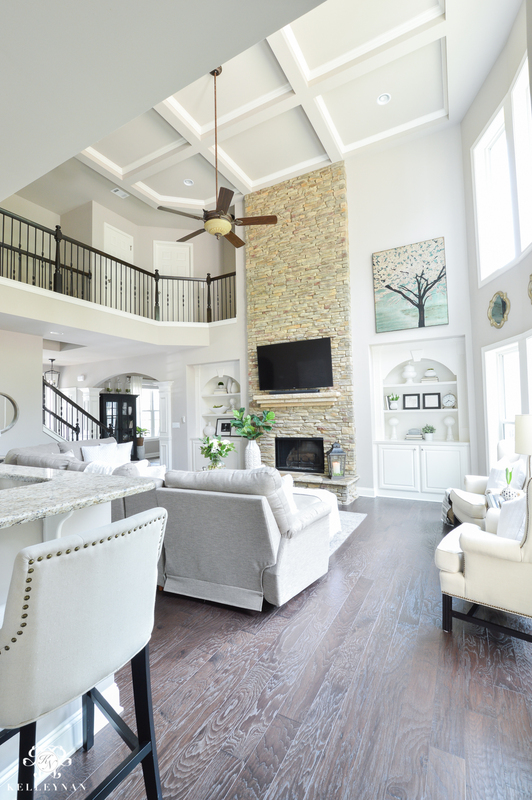 What would you say is your type of style through out your house or when you are looking to style certain areas in your home? Awesome arrangements Kelley Nan! Thanks for some really great ideas! I love the way you’ve styled your shelves! Would you mind sharing what size your West Elm Accordion vase is please? I can’t tell if it’s the small or the medium and I like the way yours looks on the shelf. Thanks! This post is extremely helpful and great at explaining styling techniques!! Love love love how you stacked the pinecones in the bowl in the first pic. It drew me in and made me want to look closer.